The Corbett administration today asked a state appellate court to conceal a series of messages written by top state attorneys involved in Penn State’s hiring of Louis J. Freeh. 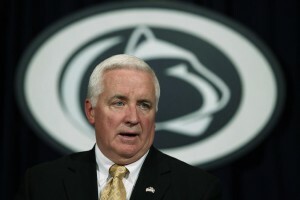 Exchanged in the early days of the university’s 2011 Sandusky crisis, the three e-mails discuss suggestions of investigative firms that Corbett’s office wanted the university to hire. The Office of Open Records ordered the e-mails’ release last month. But lawyers for the Department of Education have filed to fight that decree, arguing the records are privileged communications between attorneys and their client that should not be released to the public. The e-mails were prompted by a request from former secretary of education Ronald Tomalis, who, as a Penn State trustee, helped the university navigate the early days of the crisis. James Schultz, who at the time served as deputy general counsel, passed the “Attorney Recommendations” to his boss, then-general counsel Steven Aichele. Aichele forwarded the recommendations to Tomalis. As Pennsylvania General Counsel, Aichele served as the governor’s chief legal advisor and presided over legal decisions throughout state government. He eventually became Corbett’s chief of staff until he returned to the private sector in July last year. Schultz replaced Aichele as Corbett’s general counsel. He has authority over the the education department’s legal team. The education department told the OOR that e-mails contain recommendations of legal firms which constitute “legal advice” that shouldn’t be disclosed to the public. Tomalis, in an affidavit, also stated he never waived the attorney-client privilege. The OOR decided that the department didn’t met its burden of proving the records constituted legal advice. Today’s filing marked the second time the Department of Education asked a court to prevent the release of public records related to the Sandusky scandal. The first involved other e-mails sent to Tomalis, but was resolved out of court in January last year. The Sunshine Fund is also fighting for the release of more than 150 other records sent between Tomalis and Freeh investigators. Penn State has opposed that release. Oral arguments in the case are scheduled for September. It’s also challenging the refusal by the Attorney General’s office to release correspondence with Freeh investigators. A decision in that case is expected later this year. More than 250 people from 182 cities in 29 states have contributed to the Sunshine Fund, which has raised $30,000 to fight the Corbett administration’s refusal to release public records related to the Sandusky scandal. It is still accepting contributions to meet its fundraising goal of $50,000. The OCR Edu reiterated PSU’s responses as if typed line per line verbatim in 1998, in a case where a student sought relief from a punitive academic dismissal when receiving an altered and failing grade from clinical fieldwork in which Gerald A. Sandusky was present with Head Start children. This is expected. Whether before or after Corbett loses in Nov., the truth will come out. Thanks, Ryan. Your contribution to this effort has been invaluable! Ryan, Thank you for your work! What bothers me is that no one seems to be concerned about “The Second Mile” when it seems to have been the real problem … that was too sensitive to be documented in e-mails! Regardless, it is time for Corbett to stay out of it? He is a major part of this whole mess!